We are honored to share our newly released podcast with Dyslexia Quest! Our founder and CEO, Mya Dunlop, and lead Learning Specialist, Stacy Rosenblum, had the wonderful opportunity to sit down with dyslexia consultant Elisheva Schwartz to discuss learning differences, the writing process, and exactly how our writing application came to be. The brainchild behind the entire company is truly Myles Dunlop, nicknamed “Mylo”. Myles struggled with dyslexia in school, particularly when faced with writing assignments. Mya recalls the frustration of feeling helpless in watching her son fight to get his creative thoughts on to paper, and remembers him saying “I have all of these ideas, I just can’t find the key that unlocks the part of my brain that gets those ideas out!". Enter Stacy Rosenblum- a learning specialist who actually has a degree in engineering. Stacy explains that she grew fascinated with applying the analytical problem-solving skills acquired through her engineering courses to students with learning disabilities and special needs. After seeing her peers work with only conventionally-developing children, Stacy was drawn to the challenge of figuring out the mental roadblocks in students who aren’t typical learners. Stacy was interested in helping these students unlock their strengths and make it through schools, since, as she says, “the odds are stacked against them”. After working with Stacy and learning the tools for successfully writing essays as a dyslexic student, Myles was inspired to build an application to help others with the same problem. Through collaboration with Stacy and other advisors within the education space, Mya launched MyloWrites and began touching the lives of adolescents and teenagers who struggle with learning disabilities. Watch the full podcast here to learn more, and click here to read more about Elisheva and all that she does for the dyslexic community! Last month, MyloWrites hosted a screening of Beyond Measure, by filmmaker Vicki Abeles. Ms. Abeles is well known for her previous film, Race To Nowhere, which documented the enormous pressure that students face from exhaustive assessments and huge homework loads. Where Race To Nowhere illuminated all that is wrong in our educational system, Beyond Measure sets out to propose meaningful and evidence based strategies for positive change. Beyond Measure is specifically a response to the stories of successful schools that Ms. Abeles heard as she toured the country, screening Race To Nowhere. Beyond Measure tells the story of courageous educators and parents, the “strategically subversive heroes and heroines,” who innovate, collaborate, and take risks to move beyond the miserable standard of education in the U.S. These revolutionary educators ask new questions about student success and aren’t daunted by the patience, hard work and perseverance it takes to affect change in our country’s monolithic public education system. They challenge the assumption that progress must be quantified. They dare to rethink the purpose of school from a place in which knowledge is transferred passively from teacher to student to a place in which individual passions are fostered. And they aren’t sitting around waiting for political and policy change - they are facing this challenge head on and changing a broken system of education, one school and district at time. Prominent education researchers and advisors including Sir Ken Robinson, Carol Dweck, and Jo Boaler provide the structure of evidence which supports the revolutionary ideas of student autonomy and ownership of learning. The viewer gets a look inside high schools from all different areas of the country whose leaders are committed to change. We see students who are clearly engaged, and whose enjoyment in their learning is evident in the smiles on their faces. MyloWrites is the perfect partner for this film, and hosting a screening was an obvious choice for us. At our core, MyloWrites knows how important it is to keep students motivated and inspired to learn. Struggling and becoming defeated however, is an unfortunate, yet real byproduct of our passive and antiquated educational system. This struggling and defeatism leads to overwhelmed students who shut down, lose interest, and become unmotivated. Teaching to universal standards, and with the expectation that every child perform to preconceived levels of achievement is a tenet of our aged educational system. Instead, we should embrace the naturally diverse rates of cognitive development and celebrate this diversity. We need to hone in on students strengths to foster learning and support areas of struggle with new and innovative educational approaches that best suits individual needs. It is important that we understand that motivation and self confidence is the key to student success, as we see so clearly in Beyond Measure. Every individual wants to be recognized and feel successful in their areas of strength. This recognition of mastery translates to motivation throughout all areas of life, even for those who may need more support to master new skills. It is our job as parents and educators to recognize and celebrate learning differences in order to ensure that we keep our children engaged, motivated and confident. Beyond Measure is a call to action for educators and parents everywhere. Sir Ken Robinson sums it up perfectly, “change comes from the bottom up, not the top down.” Parents and educators are the agents of change, and their action is the only way that our educational system will develop into a system that is equitable and just for all students. Don’t wait another minute! Go see this film! Find a screening of Beyond Measure in your community here. If there isn’t a screening closeby, consider hosting one. Be an agent of change in your community! Be sure to share your thoughts with us by commenting below or tweeting us @Mylowrites! MyloWrites had the wonderful opportunity to attend a creative writing / storytelling class hosted by Playable Design in Beijing, China. Playable Design uses LEGO bricks at the core of a creative multi-sensory learning process. As we know, all people learn new skills and concepts through different modalities and learning styles. Each of us employs multiple learning styles and strategies, and are stronger in some modalities than others. Be it visual, auditory, tactile (touch), or kinesthetic (movement), various methods activate different parts of the brain. Have you ever danced in mathematics, or sung a song in science? If you have, then you know a bit about multi-sensory learning. Playable Design's curriculum spans from numbers and spacial awareness, to creative writing and story telling. The class we attended was creative writing / storytelling geared for ages 6 to 10 years. 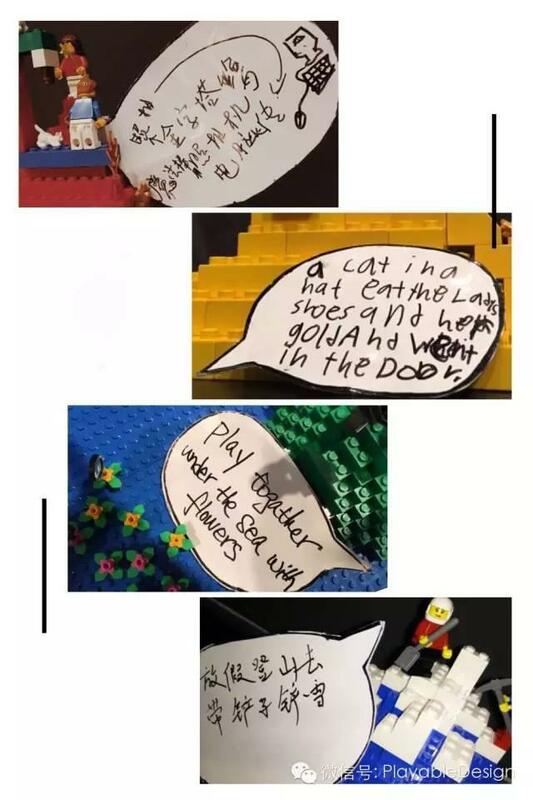 Through the use of LEGO props and prompts, and specially developed Playable Design flash cards (displaying images of activities, places and people), children were inspired to create and write stories. The class started with each student selecting a simple prebuilt LEGO structure, a random Playable Design flash card, and a LEGO accessory. This combination of props were the genesis of idea gathering for story telling and creative writing. With these three props in hand, each child created a sentence using all three components; the pre-built LEGO object, an image from the flash card, and the LEGO accessory. Using these visual prompts helped students to generate ideas for a creative writing piece, which could otherwise have been a daunting and anxiety producing task for many students. Once the sentence was developed and written, the child then proceeded to build out a physical representation with the LEGO bricks. This process supported further generation of story details and the development of additional thoughts and ideas. These ideas were then turned into sentences and ultimately, depending on the age of the child, into a paragraph length scene or story. Success! Children have so much to say, however natural differences in cognitive functioning may limit their ability to translate a thought into a sentence. Playable Design's multi sensory, prop and prompt driven approach immediately relieves the anxiety a child may experience, and allows for a alternative learning strategy to support the creative writing process. Active participation, especially for young learners, is a key part of this successful approach. Exposure to multi-sensory learning helps students discover learning strategies and techniques that are best suited for their individual brain. Understanding and honing the learning strengths that best fit an individual is key to improving achievement and the acquisition of information. Multi-sensory learning provides more pathways for understanding new information, greater capacity to remember it and more ways to recall it later. Children with learning differences typically have difficulty absorbing new information, especially if it is abstract or involves memorizing sequences or steps. Multi-sensory teaching techniques help break down these barriers to learning by making the abstract more accessible, turning lists or sequences into movements, sights and sounds. In our continued quest to broaden the awareness of learning differences, MyloWrites is always looking for ways in which different organizations incorporate and support multi-sensory learning. In the end, multi sensory learning is more fun, works well for every learner, and should be part of every teacher's curriculum. This creative kind of teaching doesn't have to be unorthodox, but it definitely goes beyond the traditional approach to education that relies almost exclusively on visual (reading text) and auditory (listening to the teacher talk) presentation of information.